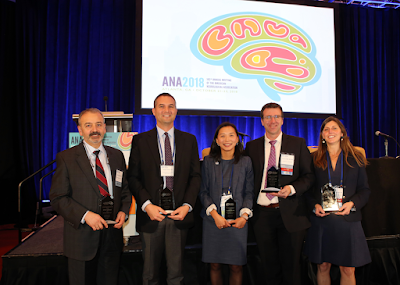 The American Neurological Association recognizes the accomplishments of academic neurologists. At the 2018 meeting, all three recipients of the Derek Denny-Brown Young Neurological Scholars awards in basic and clinical science had a Penn connection. Lauren Sansing (Penn Residency class of 2006), recognized for her work on "Inflammation and Resolution after Intracerebral Hemorrhage- Lessons from Mouse and Man"
Peter K. Todd (Penn Residency class of 2008), recognized for his work on "How Repeats Break the Rules to Cause Neuro-degeneration"
Alice Chen-Plotkin, MD (Penn Neurology faculty), recognized for her work on "Big Screens and Where You Go from There: Towards Translation in the Neurodegenerative Diseases".